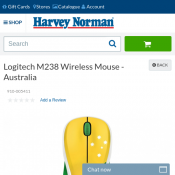 Show off your patriotic side while staying in close control of your computer with the Australian-themed Logitech M238 Wireless Mouse. Featuring a Nano receiver that facilitates 2.4GHz wireless connectivity, the M238 executes commands with minimal input lags. For secure transmissions, the Logitech M238 Wireless Mouse employs a 128-bit advanced encryption standard. Thanks to its 10m range*, the M238 mouse is suitable to use in large desks or wide spaces. This Logitech mouse has a pre-installed battery with up to 12 months runtime**, making it ideal for frequent usage. Ideal for multi-device users, the Logitech M238 Mouse can be used with Windows, Mac, Linux, and Chrome OS devices.